I feel a bit guilty that this blog is mainly about Jake as the reason I started it is so much less of an issue or even a thought these days. Plus there is another child; I do feel a bit sorry for Freddie as the second sibling because he never got the same amount of attention before he was born, there was less anticipation as we knew (as much as you ever can) that he'd be fine when he arrived. He's also had less of my time as he came along just as I was transitioning away from a local job and started commuter doom working for the man instead of myself. So the combination of job proximity, having to divide time, love & attention between two kids and not one as well as the lack of anything being the matter, has been something of a triple whammy. Obviously the innate love is the same but the patience, quality time and focus is definitely different for want of a better word. Having been through Jake's operations along with the natural anxiety the first baby brings and the absolute and utter newness and life-turned-upsidedown-ness of your general situation, I suppose I thought number two would be a breeze. Clearly I was wrong as I've never been as tired, stressed or mentally worn out as I have in the last three years. No offence Fred, it's not your fault but the combination of moving from a couple with a kid to a full blown complete family of four with a cat and a fish. Freddie gets frustrated that he can't do everything his big brother can but when Jake was his age his only frame of reference was us the giants as opposed to someone only six inches taller and much more on his intellectual level (no offence Jake!). Anyway, he's getting there in between tantrums and the crying or shouting and zero ability to follow instruction which seems to last some days from wake to sleep. But it all adds to these times when the days are long but the years are short. I can't believe where Jake's nearly six years have gone, in the same time from now he'll likely have an underage Facebook account and will be travelling to places on the train on his own but we'll be happy he's got his smartphone so we can stay in touch. We'll probably wish he was five again and Freddie was still watching Despicable Me 2 stark naked as he is while I write this. It's easy to wish their difficult years away so that meal times and holidays become more bareable but I'm sure we'll want them back. 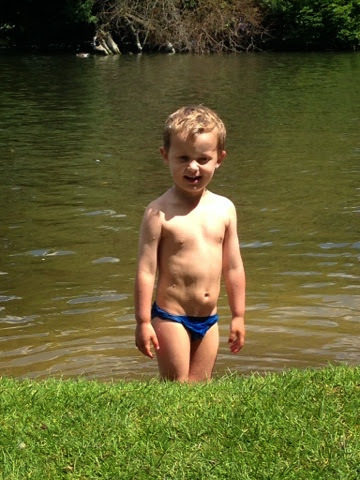 With that I'm going to take the naked child swimming just as soon as I can persuade him to put on a pair of shorts.